Sorry I haven't posted in ages. "Busy" is an understatement. I'm down 87 pounds now, and feeling awesome! I'm taking the holidays off, and just shooting for reasonable portions. The plus side is WW keeps sending me special offers to rejoin. And I will, such a great program. well done moonrise! I am thrilled every morning to put on clothes that fit. Down 95.8. Had a few stubborn weeks where the scale barely wanted to move, but it finally did. Getting close to that 100-pounds-lost milestone. I did something the last two weekends that I thought I'd never be able to do. I fell in the shower years ago, and messed my knee up. It's weak, tires easily, and tends to fly out from under me if I'm not super-careful. Because of that, I can't walk long distances or stand for long periods of time. I have to use a wheelchair when getting groceries and stuff like that. Well, two weekends ago, DH and I were camping at a nearby state park, and they have a gorgeous lake that's got a dam and an amazing waterfall that spills over the dam. There's a 1-mile trail that goes around the lake. I decided then and there that I was going to walk around that lake. And I did! Granted, I was using my walker to hang onto (lots of tree roots in the path), but by golly, I walked that whole mile! The following day I hiked about 1/2 mile or so on a slightly more difficult trail, again with my walker, but I made it just fine. I probably looked ridiculous with the walker in the woods, but I was having so much fun that I didn't even care. And this weekend I walked another mile at a different park. It was freezing cold and raining, but it was still very pretty. This evening I ordered me some hiking boots. I never in a million years thought I'd have any interest or the ability to go hiking. DH (who finally noticed and acknowledged that I'm shrinking!) said he'd be happy to carry a folding chair or stool for me when we're on a trail so I can sit down and rest my knee if I need to, and that I can probably use hiking poles rather than my walker since it's very clumsy to maneuver around trees and rocks and roots. I'm not sure if I'm ready yet to leave my walker behind completely, but we'll try some short trails at first and see how it goes. Who would've thought ... me, hiking? 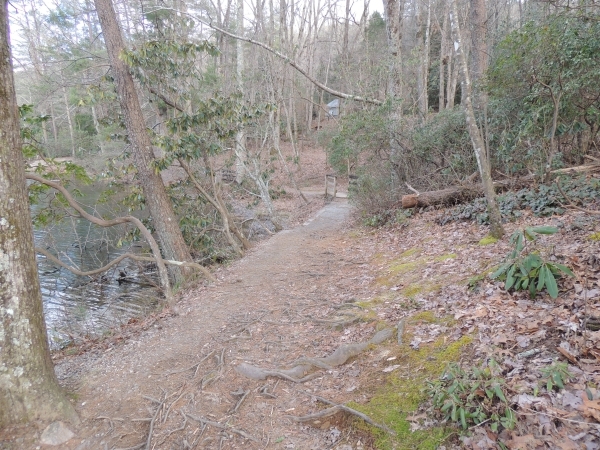 Here are a few pics of the lake and the trail around it. I didn't walk down to the platform beside the waterfall. Kind of leery of that many steps! DH walked down there, though. 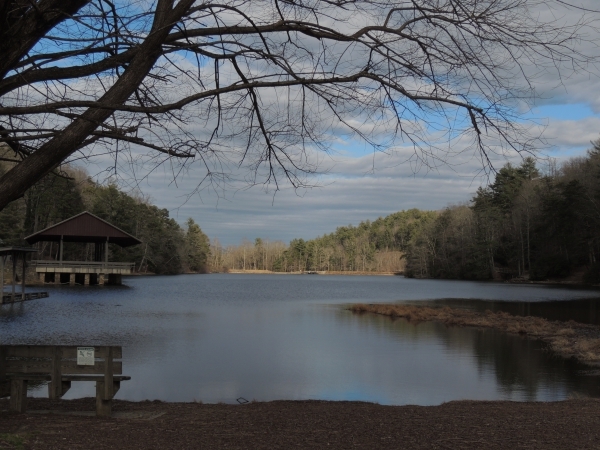 Lake Trahlyta, Vogel State Park, Blairsville, Georgia. 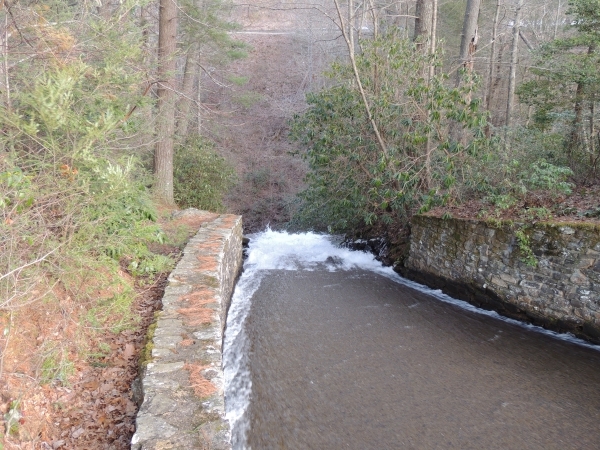 The spillway, where water goes out of the lake and creates the waterfall. 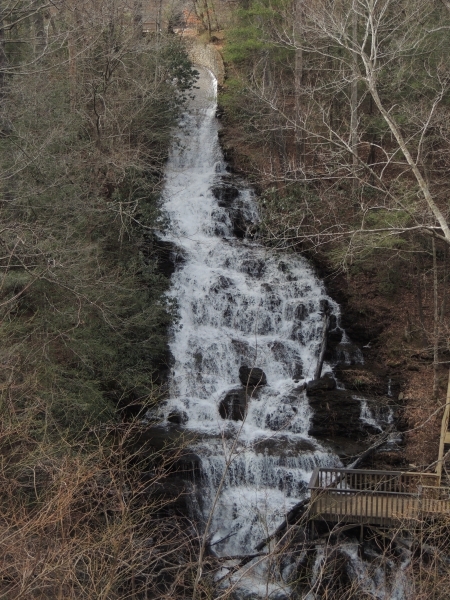 Waterfall as viewed from the road before you get to the state park. There are steps leading down to the platform. oh gosh, your accomplishments and determination made me cry. We mostly hold ourselves back, not what we determine are our afflictions. knee injuries are really common in sports, consequently there are a lot of different styles of support wraps, might try those too. I am SO proud of you! I'm still off program, still at my last sign in weight. The transfer of weight watcher dollars to local yoga dollars has worked out well for me, but it is a constant battle, I think I was just born hungry and gone on from there. WW had a free week two weeks ago so I went to workshop and touched bases with a lot of the ladies. It was fun. Wow, Moonrise, that is fantastic. Congratulations, Moonrise!! You should be so proud of yourself! You are amazing! We mostly hold ourselves back, not what we determine are our afflictions. I agree 100% with this. Reminded me of this song Toby Keith wrote for Clint Eastwood's newest movie after asking Clint what keeps him going. Clint's reply was "I don't let the old man in." I've officially lost 100 pounds, as of today! I just read this entire thread. You ladies should be so proud of yourselves. I have been trying to eat better (I won't say dieting) since February. I write down everything that I eat and try to stay around 1200 calories. And I walk on the eliptical at least 5 days a week. It's going pretty well. But reading what others are doing is really inspiring. Keep up the good work! Hey all. I haven't posted in ages. I went back to the Points Plus program and use the iTrackbites app. I was not steadily losing weight on Freestyle. I had very good success with the PP program in the past and have started to lose steady weight once again. Onward and downward!